Yes, all of these describe Sister Laverne Donahue. Sister was born on a farm near Holy Cross, Kentucky, which gives her the distinction of being the only Kentuckian who is a member of the Hospital Sisters of St. Francis. Speaking to her and listening to her southern drawl will quickly convince you of her Kentucky roots. The seed of Sister's religious vocation began to develop during her grade school years when she was inspired by the example of an Ursuline Sister who taught her. As a teenager, Sister worked and stayed with a family in a nearby town in Kentucky. This was close to a Catholic Church, which afforded her the opportunity to make frequent visits and attend daily Mass. At the age of 21, Sister moved to Louisville and lived with her older sister. She was able to attend Mass on a regular basis and experienced a deepening of her call to religious life. The following year, Sister made a retreat and determined it was time to examine this persistent call more closely. She wrote to several religious communities for information and felt drawn to the Hospital Sisters by the information she received. This prompted a visit to Springfield where Sister Laverne was impressed by the prayer life of the Sisters. However, she returned to Louisville thinking this life was not for her. She continued to work in Louisville, but the Spirit's call persisted. Finally, she made the decision to enter the Hospital Sisters of St. Francis Religious Order. Sister Laverne entered the Hospital Sisters of St. Francis in February 1948. Following her postulancy and novitiate, Sister professed her religious vows on October 4, 1950. She attended St. John's School of Nursing in Springfield. Following graduation from the School of Nursing, Sister made her perpetual vows on October 4, 1955. She then attended Creighton University, College of Pharmacy in Omaha, Nebraska. Upon completion of her pharmacy education, she served for 10 years as a Pharmacist at St. John's Hospital, Springfield Illinois and St. Mary's Hospital, Streator, Illinois. In 1969, Sister Laverne began a lengthy period of service within the religious community. She was the religious coordinator for the Sisters at St. John's Hospital, Springfield, Illinois for one year. Then she began to work with the Sisters in various stages of formation-three years with the Sisters in Temporary Commitment and six years with the Sisters in Initial Formation. During this time, Sister Laverne also attended the Institute of Religious Formation in St. Louis, Missouri. Sister relates that this time was challenging because the community was working toward the implementation of Vatican II. After this time of working in Formation, Sister Laverne became a Core Member of the community's House of Prayer in Henry, Illinois for three years. She returned to the Motherhouse in Springfield, Illinois where for six years she served as the Assistant Local Coordinator at the Motherhouse. She found this work with the Sisters to be a very rewarding experience. 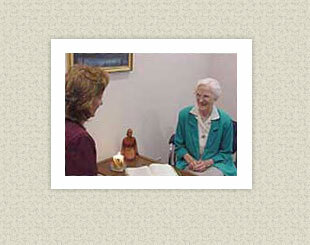 During this time, Sister also volunteered in the St. John's Hospice and Bereavement Home Care Programs. In 2000, Sister Laverne celebrated her golden jubilee of religious profession. She expressed gratitude to the Community and to God for the Gift of the Spirit's guidance and strength in her journey as a Hospital Sister of St. Francis. But do not look for Sister Laverne among the "ranks of the retired"…. Sister continues to minister in a variety of ways. She assists with retreats for her religious community, gives privately directed retreats, serves as a spiritual director, and is a Spiritual Assistant for the Secular Franciscans.